Paco Rabanne Black XS Potion Pour Homme is a luxury fragrance from Paco Rabanne! 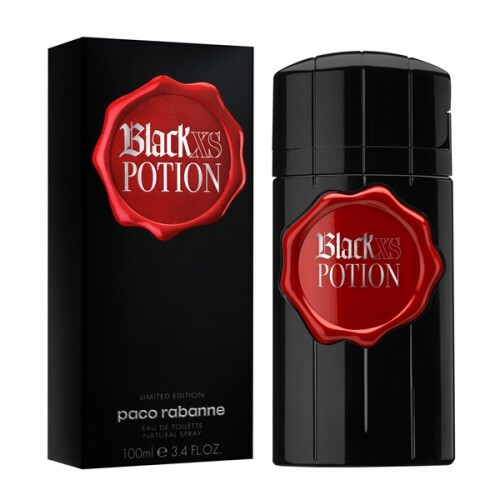 Paco Rabanne Black XS Potion Pour Homme 100ml. Eau De Toilette is a luxury fragrance from Paco Rabanne! The ingenious composition of wood and fern scent called Black XS Potion. The magic elixir that will bring its owner recognition and honor. The most beautiful women will adore you, and men - in vain attempt to unravel the secret of success. Bunch of French intimate fragrance opens slightly chord fresh juniper fruit. He will blow the pleasant coolness of the forest, smoothing experiences and highlighting the elegance. Cashmere tree with wormwood will create elegant, intoxicating couple in the heart of the work. The finish is warm and intoxicate Dutch rum with a deep accent labdanum. There are things in the world, you are perfectly decorated: classic suits, confident movement and fragrance Black XS Potion. Allow it to make your style perfect! Release date: 2014 Manufacturer: France Gender: Male Classification of aroma: woody, fern initial note: juniper berry note "Hearts": wormwood, cashmere wood Final note: labdanum, rum Perfumers: Olivier Cresp, Emilie Coppermann. Bewitching men's fragrance in 2014, leaving no chance to resist the beautiful half of its owner. Magical elixir, a prisoner in a mysterious black bottle with a scarlet seal, able to charm and captivate all. The man, who prefers this fragrance, has the exclusive charm and magnetism. There is an irresistible desire to obey and remain forever in his arms. At the heart of the new essence preserved the spirit of the popular original, created in 2005. The action begins with the magic sound of fresh juniper preceded velvety base notes. It harmoniously intertwined tart bitterness of wormwood with seductive sweetness of amber, vanilla and musk. The aroma of juniper soothes and helps make the right decision. Bouquet of vanilla and amber relaxes and improves mutual understanding. Resinous and warming breath labdanum fixes flavor, leaving a unique trail. An exciting composition envelops man and emphasizes its natural appeal and sensuality.